« How Effective is Your Leadership? Man O Man did I struggle with some of the skill sets required to be a great leader when I was young and thrown into my first leadership role. I didn’t possess the natural skill sets or the mentorship to identify and execute the most effective leadership strategies. However, I did possess one very important characteristic. I was highly enthusiastic. When I was a brand new sales manager I placed a sign on my desk. The sign read, “Attitude is Everything.” Do you believed in this statement? I did then (and still do). Are you energetic and passionate? Do you share your energy and passion with those you work with? For me, it was important to be unwavering in holding a positive attitude and encourage my team to approach challenges and tasks with an enthusiastic and positive attitude. How do you embody enthusiasm? 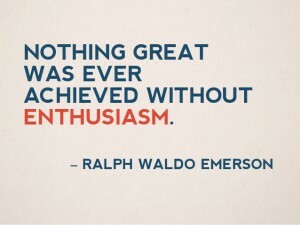 What steps can you take to crank up your enthusiasm? Enthusiasm is not "cheerfulness." It is the energy and drive to accomplish what needs to be done. A burning desire, not just an accomplishment. Enthusiasm means you do what you do with passion. Willingness - Be willing and open to a greater level of enthusiasm. At first, it might feel like you are “faking it until you make it.” However, over time, the enthusiasm will become more and more authentic and contagious. Don’t rush it, but rather allow your natural state to grow in the area of enthusiasm. Vision - Hold the end result in mind. What are you goals? How does it look when it all works out? Put yourself on your proverbial “mountain top.” How does it feel to be there? What level of enthusiasm was embodied to create this end result? Come from your vision. Attitude IS everything. You can lead and accomplish great things with an enthusiastic attitude. Today, I choose to be enthusiastic in service of my goals, dreams, and the vision for the life I am living. I encourage you to join me.